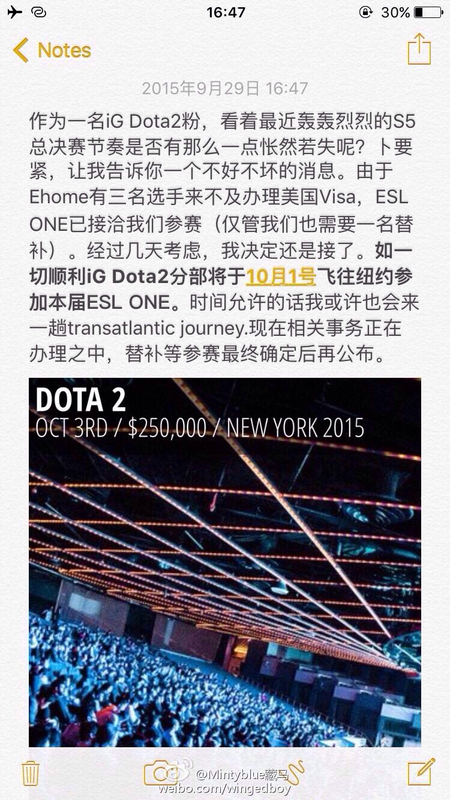 Invictus Gaming will be replacing EHOME at the ESL One New York main event due to Visa issues from EHOME. Earlier today EHOME announced their decision to drop out of ESL One New York because three members on their roster could not obtain their Visas in time. Instead, Invictus Gaming, the runner-up of the China qualifiers will be replacing EHOME to participate at the ESL One New York main event. Considering that four players on iG’s current roster had made the trip to Seattle earlier this year for TI5, it is speculated that their new drafter Peng 'Super' Su will not be participating due to possible Visa issues. ESL One New York will begin this weekend, with eight teams fighting for a starting prize pool of $250,000.